Lightweight, Versatile Floor Sign Makes A Heavy Statement About Safety. 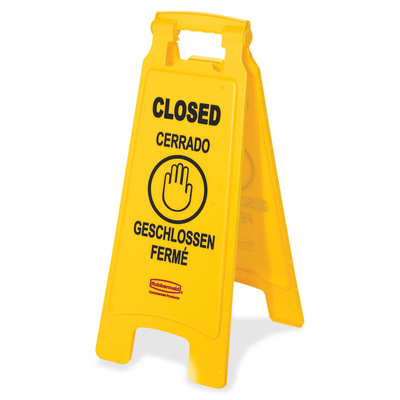 Closed Warning Message On The Two-Sided Sign Is Imprinted In English, French And Spanish For Effective Communication To Broad Audiences. Floor Sign Works Well In Narrow Areas. Flexible Locking-Style Hanger Makes Sign Stationary And Visible From All Directions. Folding Design Allows Convenient Storage Or Transport On A Janitor Cart (Sold Separately). Durable Plastic Construction Will Not Rust, Corrode Or Fade. Two-Sided, Bright Yellow Design Meets Osha Requirements. Ansi Compliant Multilingual Graphics Warn Of Nearby Hazardous Area..
Lightweight, Versatile Floor Sign Makes A Heavy Statement About Safety. Closed Warning Message On The Two-Sided Sign Is Imprinted In English, French And Spanish For Effective Communication To Broad Audiences. Floor Sign Works Well In Narrow Areas. Flexible Locking-Style Hanger Makes Sign Stationary And Visible From All Directions. Folding Design Allows Convenient Storage Or Transport On A Janitor Cart (Sold Separately). Durable Plastic Construction Will Not Rust, Corrode Or Fade. Two-Sided, Bright Yellow Design Meets Osha Requirements. Ansi Compliant Multilingual Graphics Warn Of Nearby Hazardous Area.